I guess it’s pretty obvious why writing detailed logo design process posts is useful, but a small reminder can be useful. Over the last year I have significantly upped my game in this area. Each logo design seems to lead to a more detailed logo process post. A personal achievement and record of your hard work. Personally, I do love trying to describe my reasoning, my justification, my views, my thoughts for each logo design I complete. It often surprises me how much I have put into each logo project, you can easily slip into autopilot during a project, it’s all part of what you do, a skill honed down to near perfection. Going back over all the details, revisiting the project, taking a look at your sketches can really reinforce the level of work that can go into a logo design. The sense of pride and accomplishment at this point is as good a reason as any to write a logo process article. As well as for personal reasons, the main advantage for doing this is for potential new clients. It’s no secret that as designers, our work can often be viewed rather simplistically. A simple looking logo design can be deceptive, it can create a false and low sense of value. If it’s so simple, then surely it didn’t’ take long, so why should I pay so much money? A classic example of this can be seen in some of my recent process posts, Orb Web Solutions, Keyboard Kahuna and Foehn & Hirsch Rebrand to name a few. 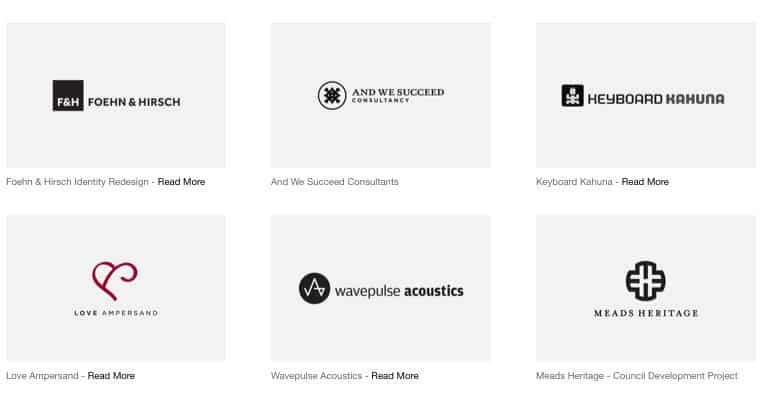 These logo designs, on the surface, look deceptively simple. However, reading the process posts, creates a whole new and unexpected appreciation of the finer details and level of research and thought process’s that often go into a logo design. So as well as providing an interesting read, it’s a form of justification. You are clearly showing exactly what can go into a project. The more detail you include, the more you can justify your services, which ultimately leads to a confidence in asking a fair and decent price for your work. The more you relevant copy your include in your blog, the more you are contributing to the overall SEO success of your site. Compare a solitary portfolio with a portfolio and a number of detail logo process posts and you will see what a no-brainer this can be. Then you get the likely track-backs and ping-backs when people include your latest logo design process post in the next logo process list post. Designers love to read other designers process posts, it’s a great way to pick up tips and tricks as well as just good old natural curiosity. They are getting more popular, so they are appearing in more and more places. There is a great new website called ProcessID, a brilliant website dedicated to showcasing a whole variety of logo and identity process posts from any designer willing to contribute. This is a wonderful and idea and helps people get their own logo process posts out there to others interested in this. They often have discussion posts as well, so it’s a valuable site to visit. Steve, the chap behind ProcessedID, added these relevant points why a logo design process post is useful, whilst commentating on this post. 1. Help new designers understand what goes into making a logo design appropriate, impactfull and adaptable, and more than a pretty picture. 2. Illustrate to clients, the differences in what we provide in comparison to $99 stock logo sites. 3. Share how we work with other designers, exposing all of us to new ways of thinking and working. Just putting a logo up in your portfolio, with no explanation, is a potential fail. Given the sheer volume of logo designers all looking for work, the less you do to market and explain your work then you are risking clients forming their own opinions. If your style of logo design is minimal, clean and simple (like mine), no matter how much work you put into creating these deceptively simple designs, you are more likely to have your work passed of as something that took 10mins. This was partly why I felt it was important for me to create very detailed logo process posts. Because I do have a certain style of logo design, I was at risk of some people, clients, wondering why they should pay any more than £100 for a logo. Therefore I needed to ‘convince’ clients why it’s often worth investing over £1000 for a strong visual identity, not £100. If it looks simple, then it’s quick and easy to do. That is the assumption you need to prevent potential clients from forming. This assumption can stick if you don’t do something about it. The logo is then seen out of context which is a real danger to having your work unappreciated and undervalued. If people can’t put your work into context, it’s hard for anyone to look past the surface. This can then lead to a lack of self confidence if potential clients just make passing comments, that in no way relate to the amount of work you put in. Having a high visible website and firm presence on social media sites like Twitter & Facebook bring valuable advantages to your logo design clients. The more you promote and market your work via various logo design inspiration sites and through your own portfolio and subsequent logo process posts, your client will be most grateful for all this added exposure. I factor this in, and try to use this as a direct but subtle selling point. Of course it comes down to the company and business in question to how relative your particular audience is. If your client that has a product or service that could potentially be valuable to your website readers and social media contacts then your efforts will be appreciated. A logo process post is a great way to get your clients core message over in a rather unique way. Careful not to oversell it, people will wise up to such blatant advertising. Keep to the point, the creation of the logo, the rest will come naturally. Once you have done a few of these posts, it will be natural to then want people to read them. I get very excited after every new logo post is completed, it’s quite a buzz actually. I was stupidly excited and proud of myself after I completed the Foehn & Hirsch process post. More a sense of relief after realising how long it took to complete. Make sure they are easily found. For example, on my logo design portfolio, I have included a ‘Read more‘ link under each logo design where I have a complete article. When a client now comes to view the portfolio, they have a clear link to found out more. An easy and excellent way to draw the visitor in. The more interest you provide, the more they are likely to stay and read more and hopefully hire you. I also have other links dotted around my site, one is a small banner graphic in my right hand side banner. So regardless of where a visitor enters my site, they should have no problem finding these process posts. The logo process post is a massive and immeasurably valuable way to promote and market your logo design skills. They can take time to do, the Foehn & Hirsch rebrand process post took a full a 12 hours to complete, but this was particularly detailed. I still tend to struggle with the initial motivation to get started, even knowing how important they are. However, once I start, there is no stopping me. I get so involved with it, determined to explain my methodology to anyone who cares’ to listen. I am still catching up with a couple of recently completed logo designs, but you can read see the Logo & Identity Process Posts I have so far completed. The natural step-up to a process post is creating a set of Logo & Identity Guidelines. It’s a great way to string out your latest project. :) These guidelines show a level of detail that can only be visualised like this. These have made a dramatic difference to how my work is viewed and I strongly recommend taking some time to play around with them. I have created a set of these Logo & Identity Guidelines as a FREE downloadable template in InDesign and Illustrator. It is a one page A4, with a simplified set of logo use advice. Feel free to download and play with.